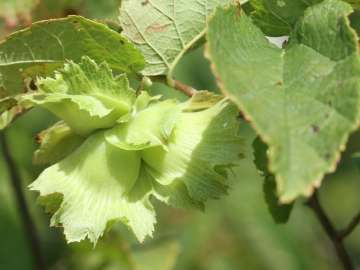 Beaked hazelnut is a shade-tolerant native shrub that is named for the beak-like shape of the bristly husk that covers the developing nuts. Always a good question when you notice something in the woods. 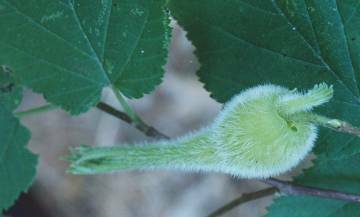 The photo shows something green and fuzzy-looking – but bristly-feeling – and round at one end but tube-like at the other end, sort of like a beak. It’s growing on a bush at the side of a shady trail, in a place such as Westborough’s Bowman Conservation Area. Is it some kind of gall or odd growth, or what? It’s something good to eat – a hazelnut, still developing inside its husk. The native shrub that produces it is called beaked hazelnut because of the beak-like shape of the prickly husk. As it turns out, you’re lucky if it’s there for you to notice. Several creatures of the woods watch it closely, and before it’s ripe, one of them will eat it. Red and gray squirrels, chipmunks, mice, ruffed grouse, deer, and even blue jays relish the nuts. And these nut eaters know what’s good for them: hazelnuts are very nutritious, containing 60% fat, 25% protein, and 15% carbohydrates. They’re even more nutritious than the acorns that are abundant in the oak woods where hazelnut shrubs tend to grow. Native Americans also kept a careful eye on hazelnut shrubs and their developing nuts. They gathered the nuts for food and ate them either fresh or roasted. Beaked hazelnut (Corylus cornuta) and American hazelnut (Corylus americana), which also grows in Massachusetts, are native shrubs related to the ones that produce the hazelnuts we buy in grocery stores, such as the filbert (Corylus maxima) and the common hazel (Corylus avellana). Those shrubs are native to Europe and western Asia. Most commercial hazelnuts are grown in Turkey, but the U.S. also produces them in Oregon and Washington. Native Americans had numerous medicinal uses for tea made from the bark of hazelnut. They used it as medicine for the eyes, heart, intestines, and skin. Even the bristly hairs on the husks of beaked hazelnuts proved useful as a medicine for getting rid of worms. American hazelnut is sun-loving native shrub that bears nuts in fringed husks. Other parts of the shrubs were valuable to them as well. They used twigs and branches in making baskets and fish traps. They wove twigs into small wreaths for babies to use as teething rings. The straight shoots that grow up from underground stems were useful for the shafts of arrows. The wood was also used for drumsticks, and the developing nuts were ingredients in a blue-black dye. How do you recognize hazelnut when the nuts aren’t on it? First of all, look for a shrub, not a tree. What’s the difference? Shrubs have many stems – rather than a single, main trunk – and tend to be shorter than trees, usually less than 20 feet tall. Hazels can spread by sending up suckers from underground stems, resulting in multiple stems that all belong to the same plant. Check the bright green, oval leaves, which alternate along the branches. They have lots of veins, somewhat like the leaves of birches. This similarity is not surprising because hazelnut is a member of the birch family (Betulaceae). If you take a close look, you’ll see that the leaves are double-toothed. In other words, the teeth on the leaf edges leaves have not one but two points, and one is larger than the other, as you may be able to see in the background in our photo. In early spring, well before the leaves come out, you might spot hazelnut by its male and female flowers. Hazel shrubs are wind-pollinated, so the flowers come out early, before there are leaves to block the spread of pollen by the wind. Both male and female flowers appear on the same plant. They don’t need the services of insects, so they aren’t large and showy. As in birches, the pollen-producing male flowers hang down in tan-colored soft drooping chains (known as catkins). They form in the fall and are visible, sealed up, on the bush in winter. They expand in the spring. The small pollen-catching female flowers appear on the branches in the spring as wispy tufts of eye-catching red threads – quite lovely if you notice them. As native plants, our hazelnut shrubs do well in spite of serving as food for a variety of native insects, including at least three different moth caterpillars. Along with beech leaves, beaked hazelnut leaves are also food for caterpillars of a small butterfly, the early hairstreak (Erora laeta), which is listed as “threatened” in Massachusetts. This hairstreak is found only in the northwestern part of the state, so we won’t see it around here. If you run across an American hazelnut shrub at this time of year, you might notice that it too bears nuts in unusual husks. As the photo shows, its husks have fringes (not beaks) and don’t completely cover the mature nut. American hazelnut shrubs grow in full sun, in contrast to beaked hazelnut, which tolerates shade. No matter what you do, keep up your curiosity about what you notice in the woods! Centuries ago, it would have been a survival skill.